With our last class, we discussed how participants of role-playing games pursue storytelling in terms of the value it holds for them, which is something learned from experience while playing. An individual's value judgment is a personally assessment of something that is good or bad in terms of that person's standards and priorities. Value judgements and experience matter, but are not necessarily correct where knowledge is concerned. This is a point we will examine more closely later in the semester. 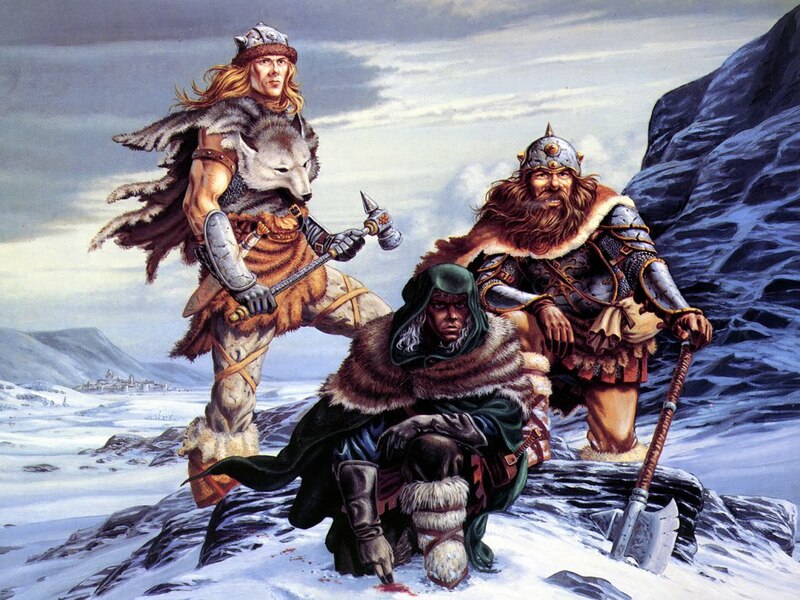 Today, let's examine another widely held value judgment, also arrived at through extensive experience from playing: that the player characters of role-playing games are extraordinary people, whose bravery and resolve encourages them to be heroes against forces that would terrify most. To understand why, we need to examine the motivations of players who choose to perceive their characters as heroes. "First, it’s performed in service to others in need ~ whether that’s a person, group, or community ~ or in defense of certain ideals. Second, it’s engaged in voluntarily, even in military contexts, as heroism remains an act that goes beyond something required by military duty. Third, a heroic act is one performed with recognition of possible risks and costs, be they to one’s physical health or personal reputation, in which the actor is willing to accept anticipated sacrifice. Finally, it is performed without external gain anticipated at the time of the act." Suppose we take a moment and consider how an Advanced Beginner's DMing efforts might act contrary to the above ... explaining, in the process, many game worlds with some of us will have personally experienced, particularly in our early years of playing. Our Advanced Beginner might tolerate players who do not act in the service of others, but only for themselves ~ whether against the other players, or the non-player characters under the DM, or even against the DM personally ~ in pursuit of their selfish desires. Our Advanced Beginner might feel pushed to participate as a DM involuntarily, because no one else will play; while some players might feel they're coerced to play a particular kind of game or rule-set, because no other option for play is available. Our Advanced Beginner may steadfastly refuse to make any concessions, or changes to their campaign, or put any personal sacrifice or preparedness into the game session ~ even a few hours time, to make the game better, may be considered a sacrifice too far. Players, likewise, may resent having to sacrifice their personal time to redraw their characters, or properly keep notes as to their advancement, or arrive on time, or any of a hundred other personal sacrifices that make group activities more pleasant. And finally, all the players may constantly gripe and insist on more and more gain for their characters, a constant flow of greater rewards, to make playing the game for them tolerable. Such players may even threaten to quit if the rewards of the game do not meet their standards. All together, this behaviour becomes unsupportable, destructive, even vindictive over time. Some groups nonetheless stagger on under this burden, supported by the unhealthy combination of a self-aggrandizing DM and selfishly motivated socio-challenged players. Most Advanced Beginniners, however, get a taste of a different game identity embraced by a competent DM, and cease to reproduce the style of play in their own campaigns. Consider: if the game story and adventure is geared towards the service of NPCs in need, this provides the players with a set of ideals that are clearly recognized as heroic. Non-heroic principles are easy to recognize ~ players who fail to answer the call to advanture, players who fail to recognize the wisdom of a mentor, players who play for selfish pursuits ~ these are clearly not the sort who are going to heroically help a village throw off its oppressors. Heroes will view the opportunity to help the village voluntarily, as Zimbardo stipulates. They will even go beyond what they are asked to do, willingly doing more than preserving the village, they will lay down their own lives if that's what it takes to make the village a thriving and happy place. No heroic player would refuse to do so ... and so that helps bind the party together towards a single goal, a single purpose, which eliminates much of the selfish infighting that would go on at the sort of table that an Advanced Beginner might tolerate. Nor would lives alone be the only sacrifice the players might be willing to make. As heroes, they would impoverish themselves rather than hold back wealth from the needy. They would soil their reputations rather than let one person suffer in their stead. And they would do all this, just as Zimbardo points out, with no personal expectation of gain. This last greatly eases the pressure put on a DM to constantly award more and more treasure. As treasure and advancement become less and less a part of role-playing, the selfish motives to gain either are stripped out of the game and what is left are players acting together to achieve personal redemption rather than personal gain. If we compare this to the stories we tell, as noted in the source material for the last class, Dan McAdams and Kate McLean argue that redemptive stories lead "to a demonstrably 'good' or emotionally positive outcome" for the participant of the game ~ providing us with legitimate evidence, through research, that acting the part of a hero, and believing that it is motivated by an emotionally healthy impulse, provides greater mental health for the participants of game play. All these things together provide a strong argument for the characters rightly being heroes in a role-playing game. Heroes work together and make good parties. Heroes contribute to the preparedness of the DM in that they willingly participate in the adventure the DM presents. Heroes ask less for themselves, reducing the need to build campaigns around the glorification of wealth and power. This makes more stable games, where the players adapt to playing at a certain power level for long periods. Finally, the absence of heroism produces patterns of behaviour that are unhealthy, divisive and campaign wrecking. It is natural, therefore, that as games advance towards competent play, DMs would encourage players to act in an heroic fashion. And players, having experienced non-heroic games, would be appreciative of the dynamic of heroic games and therefore embrace them. However ... the positivity of a redemptive story as described by McAdams and McLean is not limited strictly to moments of heroism. Any person may feel reinvigorated and redeemed by any positive choice they've made regarding any moment or event they encounter. Heroism is, yes, redemptive; but redemption need not necessarily be heroic. Heroism is, like storytelling, a matter of personal experience with a method of role-play that works better than non-heroic play. This does not follow, however, that heroic play is necessarily the only possible model that challenges non-heroic play. There is no reason to assume that heroism and the lack of it is a black-and-white model. After all, we do not live in a world of only heroes and villains. We all have the capacity to be heroes, and villains, from moment to moment, without being defined as either emotionally. Which is why we say that Heroism is a theory of role-play. The argument that the players ARE heroes is subjective and without basis of fact. What evidence can we show that absolutely supports the claim? None. So once again, as with story-telling, we must acknowledge the practicality of supporting the players' choice to be heroes, but we must not conclude that heroism is necessarily a fundamental part of gameplay's structure. Thank you, that's all for today. Please read McAdams and McLean's essay all the way through if you have not done so already. As a Soldier, I've had the privilege of supporting my nation during natural disasters. I've been on the ground during floods and the like, and I've witnessed acts of heroism firsthand. I can say with absolutely certainty that there's a tangible reward for the hero ~ the sense of well-being, honor and glory that accompanies the knowledge that you've helped another human being in a time of trouble. Now, let's be clear about this: I do not intend, in any way, to deride or devalue the work done by these service members and heroes. My intent is only to acknowledge that there is something very real about performing a heroic act and asking for nothing in return. This does not happen during role-play. It cannot happen because the player characters are fictional; the game world is fictional; their trials and tribulations are fictional; everything about the game exists in the players' minds. And while it is true that this fiction can be ~ and often is ~ very important to the player ~ again, I don't mean to devalue that importance, to imply that it isn't significant. I'm saying that it's not quite the same. Putting your character's life on the line to save a bunch of villagers from a horde of rampaging orcs is not the same as putting your actual life on the line to rescue people from a burning building. While passionate and well-meaning, I must point out that the argument you make suffers equally from subjectivity. Other readers here cannot feel the passion of your experience. They can only feel their own subjective viewpoints. It might be that your experience makes is impossible to find what they experience to be heroic; but for them, it carries the same hormonal responses: dopamine, oxytocin, seratonin, etc., to be heroic at a game table. If they went off and committed some far more dangerously heroic act themselves, they might then be jaded and find it impossible to return to the heroism effect they receive presently. But that would still be them comparing one personal subjective experience to another within their own singular framework.